Wendy's 3-D Cats: WORDLESS WEDNESDAY WITH DOMINO AND DANTE: WAFTING! WORDLESS WEDNESDAY WITH DOMINO AND DANTE: WAFTING! Postscript (even though there was previously no script): I am surprised that no one recognized the telltale (or is that telltail) pose that Domino is taking!!! Dante certainly didn't need to know what happened -- he could just smell it 'wafting' in the air! 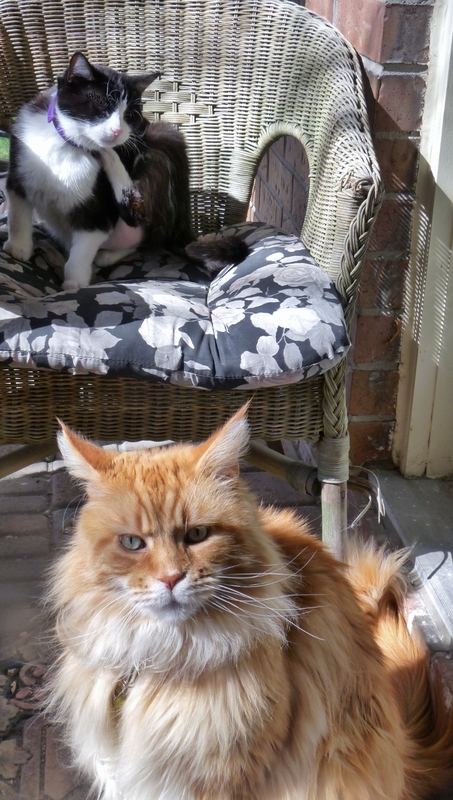 You both look very serious - go on give us a smile. Hi there you two. Did Domino beat you to the chair Dante?? Guess she is the boss around there. Have a great day. Oh look at you on your porch! You two look darn good! You two are enjoying a beautiful day! Things are never as they seem! Carl doesn't have a spastic tail, he's just spastic! Poor Domino, that would drive me crazy, too. MMM's brows started to grow in but she has removed them again. I'm thinking a wide Sharpie might work! MOL. Hi Dommy, you want to come and stay for a few days, 'cos I've been missing you.